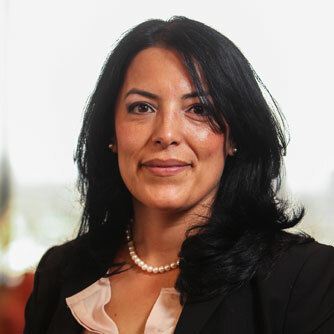 Erika Contreras is an attorney at Panish Shea & Boyle LLP and focuses her practice on catastrophic personal injury, wrongful death, and motor carrier liability cases. Mrs. Contreras has obtained millions of dollars in awards for her clients, including many seven and eight-figure verdicts and settlements throughout California. Casillas v. Landstar Ranger, Inc: Ms. Contreras was part of the trial team that obtained a $34,555,220 jury verdict for a 19-year-old man who suffered a below-the-knee amputation after he was hit by the trailer of a semi-truck while he was standing on a sidewalk. The truck driver drove a 55-foot-long trailer over the sidewalk, striking Casillas’ bicycle and knocking him to the ground. The rear wheels of the trailer ran over his left leg, causing him severe injuries which resulted in a lower leg amputation. Gomez-Gonzales v. Joe Heger Farms: Ms. Contreras was part of the trial team awarded $5.1 million jury verdict to a woman who suffered serious orthopedic injuries after the vehicle she was driving collided with a commercial truck that had illegally crossed into her lane. Newland v. County of Los Angeles: Ms. Contreras was part of the trial team awarded a $13,935,550 jury verdict to a man who was seriously injured when he was struck by a car while walking on a sidewalk in Norwalk, California. Preza v. City of Hawthorne: Ms. Contreras worked alongside Brian Panish and Rahul Ravipudi to obtain a $13,000,000 settlement in mediation for the children and parents of a woman who was killed when her car was hit by a Hawthorne, California police officer. Prior to joining Panish Shea & Boyle in 2011, Ms. Contreras was an attorney for the A.V. rated firm of Kussman & Whitehill where she represented plaintiffs in cases relating to catastrophic personal injury, product liability and medical malpractice. She has litigated cases involving defectively designed and manufactured tires and was involved in the Bridgestone/Firestone and Continental Tire Judicial Council Coordinated Proceedings where she helped injured Plaintiffs recover millions of dollars. Ms. Contreras received a Bachelor’s Degree from UCLA in English with a minor in French. She then went on to attend Loyola Law School and obtained her J.D., all while working full time at Kussman & Whitehill. She is admitted to practice law in California and Nevada and is a member of American Association for Justice, Consumer Attorneys Association of Los Angeles, the Mexican American Bar Association, and the National Association of Women Lawyers.